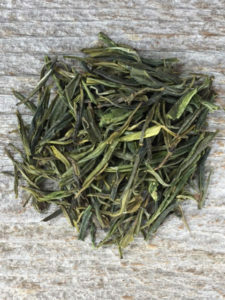 Our new Houshan Huangya Yellow Bud Tea is the newest addition to my premium line. Finding very special teas, worthy of being part of my premium line has been a pleasure and I have learned so much about these amazing teas. I have received teas from dozens of tea farms and have sampled hundreds of teas. I only add one to this line, when I think there is something very special about the tea and that is defintely the case with this newest tea. This rare tea has a delightful chestnut-orchid aroma and taste. The hand picked leaves are harvested in the Spring, in a wild, pesticide-free tea garden in Houshan Anhui, China.They are picked with two leaves and a bud. The bud is essential to the flavor of this tea, and the reason it’s called yellow bud tea. Yellow teas are less grassy than green teas. The leaves are pan fried and wrapped in a special cloth to gently oxidize them before drying. Here is some additional informatin on yellow tea. minutes. You will want to steep these leaves more than once. You will discover different nuances in each cup. You will delight in the amazing full leaves that will unfurl when steeping. The flavor of this tea is so unique. It’s truly a delight to experience. I was tasting teas with my daughter Madison when we first tried this tea and it’s her favorite in our premium line. We have developed a special friendship with our representative at this tea farm in China. When I drink this tea, I think of her friendly e-mails and the beautiful wild tea farm that she works at. I hope you enjoy it as much as my daughter and I do.